A step-by-step procedure on how to propagate pomegranate from cuttings, both softwood and hardwood, is described for high success rate. Pomegranate trees (Punica granatum L.) can be propagated from seeds or stem cuttings. 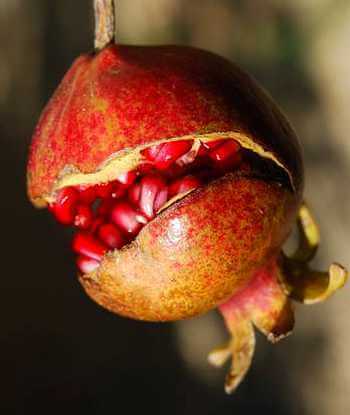 The seed grown pomegranate plants rarely grow true to the parent, whereas, the plants cloned from cuttings reliably reproduce the parent pomegranate plant. The question is how to clone a pomegranate tree. There are many ways reported on the internet to propagate pomegranates from seeds and stem cuttings, both softwood and hardwood cuttings. Continue reading below to learn on a step-by-step procedure on how to root a pomegranate cutting successfully. I have propagated several fruit and flower plants from cuttings including money plant (money plant propagation), blueberries (propagation of blueberries), bougainvillea (bougainvillea propagation), rubber tree (rubber plant propagation), etc. with high success rate, almost 100 percent. Given below is a step-by-step guide on how to root a pomegranate cutting (both softwood and hardwood cuttings) successfully. Only thing is that you need to be patient. A small pot with several drainage holes. A zip-lock bag or polythene bag with tie. Rooting of pomegranate cuttings will be successful if you plant them when the temperature is at least 20 °C (68 °F). Morning is the best time to take cuttings. The cuttings should be kept moist, away from direct sun, until you put them for propagation. Semi hardwood cuttings are easier to root, the hardwood cuttings will take a long time to root. Softwood cuttings need special care for rooting. Cuttings taken from very young or very old branches will not root well. The cuttings from previous year's growth are best for good success. The cutting should be of the size of a pencil, about 15 cm (6 inch) long, 3 -6 mm (1/8 to 1/4 of an inch) in diameter and havindg 3-4 nodes. The pot size, type and shape is not important. I usually take a small 10 cm (4 inch) pot with lot of drainage holes at the bottom, and plant 3-4 cuttings in the same pot. The rooting of cuttings will be successful if the soil is free-draining. I use potting mix and river sand in equal amount. I had 100 percent success rate for rooting pomegranate cuttings using the following procedural steps. 1. Fill the pot with the rooting medium and water well. Mix the soil and water again. Keep the pot aside. 2. After half an hour start planting the cuttings. The cutting should have at least one node just above the lower cut end which will be in the rooting medium. Remove the lower leaves and cut the upper 2-3 leaves into half. Scrape the bark near the lower cutting end. Apply a rooting hormone at the cut end including the scrapped portion, remove the excess hormone by shaking the cutting. Make a deep hole in the soil with a stick and insert the cutting in it. Do not force the cuttings in the soil. Press the soil around it by your fingers. Similarly, plant other cuttings. Applying a rooting hormone will ensure high success rate for the root formation. You can use a homemade natural rooting hormone. Please note that, I have rooted many cuttings of different plants without any rooting hormone. Enclose the pot in a zip-lock bag to keep the humidity high. I always enclose the pot in a polythene bag with a tie. The success of propagation depends on the environment in which the planted cuttings are kept. Enclosing the planted pot in a polythene bag creates the environment like a greenhouse. Put the bag in shade but warm place, away from direct sun and high wind area. Open the bag every 10 days and add a few drops of water to the soil, OR mist the stems width water. Rooting will take place in 4 to 8 weeks. You can test the rooting by tucking the stems, they will become stable. You may also see some roots coming out of the pot holes at the bottom. After the stems have been rooted, water daily. Week 1: Keep open the bag from the top for a week (bag still in shade). Week 2: Take the pot out of the bag and allow morning sun. Week 3: Loosen the soil of the pot by pressing the pot from the sides. Carefully take out the seedlings and transplant in larger pots or ground.